I have always had a list of things that I want on my phone, incase I’m ever shopping and want to treat myself I know exactly what I’ve been lusting over for a while. Today I thought I’d show you a few things that are currently on my list. Peter Thomas Roth Pumpkin Enzyne Mask £39.50 : This is available on Cult Beauty and I have been looking for a exfoliator for my face for a while, my nose and chin area get really dry and especially my nose I have larger pores. I need a mask like this to prevent my pores from showing. Hourglass Ambient Lightening powder £38 : I have wanted one of these powders since they first launched and I still haven’t purchased one of them. This is definitely something I need to invest in. Aerin Perfume in Lilac Path £85 : I smelt this perfume for the first time on a trip to Harvey Nichols a few weeks back and I just can’t stop thinking about it. It smells so nice and it is defiantly something that I would gravitate towards. One for the Birthday list I think. Kate Spade Bag £270 : Bags have always been my weakness. When I was younger I used to have a cupboard full of handbags, I used to try and use my mums bags and everyday at school I would turn up with a different sort of handbag. I can’t help it, bags have alway been my one true love, apart from makeup obviously. This one from Kate Spade is just a dream, I love Kate Spade and I when I hopefully go to the states next year I will be able to pick up myself a Kate Spade bag. Chanel Soleil tan de chanel £32 : I love Chanel makeup, it makes me feel so glamorous and I always treat myself to some Chanel makeup when I need a pick me up, or just when i’ve worked extremely hard for it. 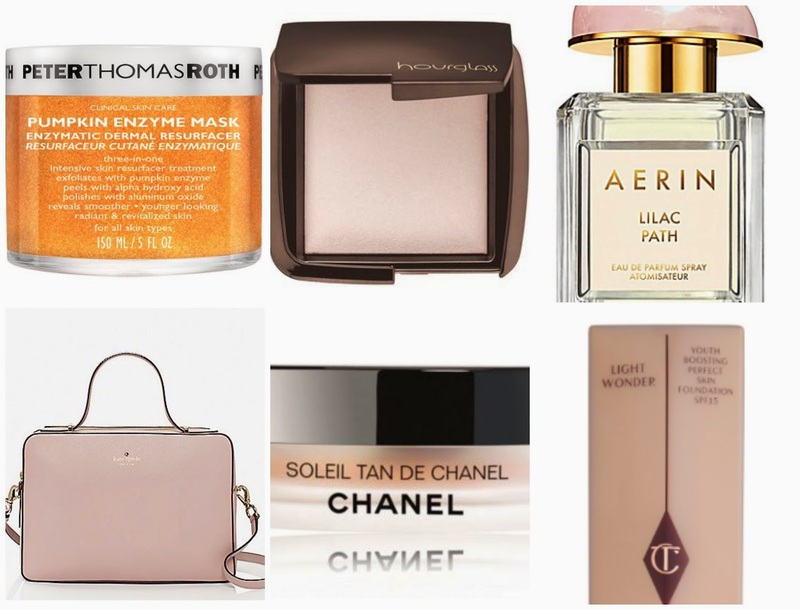 I love to treat myself to higher end makeup and the Soleil tan de Chanel is going to be my next purchase. Charlotte Trilby light wonder foundation £32 : This has been on many of my wish lists here on WLL, and I still haven’t got round to purchasing it. I had a sample of this foundation and it was so lovely, I loved the way it felt on my skin and it gave a natural glow to my complexion. Love.